Emily Baker Playing Live in Our House! All kinds of awesome fun was had last night as we hosted our first house concert since we got to Birmingham. The remarkable Emily Baker agreed to come and play – she’s been a favourite of Lobelia and I since we shared a bill with her at the Ginglik many years ago. One of the tricky things with house concerts is that each attendee, by virtue of the smaller size of the audience, represents a bigger percentage of the audience, so when a handful of people drop out at the last minute, the audience size can be shrunk to critical level.. That’s what happened to us last night. The upside of house concerts is that when that happens, the people who are there get something even more special, as any notion of ‘performance’ disappears and you get a remarkable insight into the world of the person playing the songs. As you’ll see from the video below, Emily ended up playing part-gig, part-songwriting masterclass. I learned loads about the way she writes and why she writes. It was amazing. We streamed the gig via Ustream, and thanks to us using a Blue Snowball mic, the sound is remarkable – Emily played completely unplugged, and it’s easy to forget with ‘normal’ gigs what acoustic guitars are supposed to sound like, such is the risible state of live sound in most pub/club venues. Anyway, we ended up with hundreds of people watching online, joining in, sharing the video link and buying Emily’s brilliant ‘House Of Cards‘ album (available on CD or as a Name Your Price download) – here’s the archived video, followed by her album. Watch the gig, buy the music. Simple! We were talking about the tremendous time Emily had with you. Sunday like a lovely couple of gigs! Aha! Dear Emily, due with us soon, to exchange a fevered guitar track for some house-speciality lasagne! You might enjoy this version of “Never Thought I’d…” – sung for us a little while back. She is fabulous, a wonderfull songwriter! 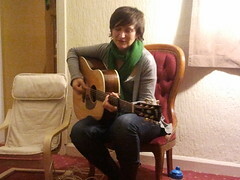 Emily played this week at our house in Penzance and blew everyone away with the quality of her performance and songwriting. She was entertaining annd all round delightful. She even found the energy for acouple of songs at the local pub jam session after! Pz wants more! she has that effect…. we managed to wangle two nights in a row after which we were still gagging for more!